Buy and sell unused and used Agricultural Tractors on IronPlanet. From Articulated Tractors to Track Tractors, and even Antique Tractors, IronPlanet has all kind of Agricultural Tractors to assist with all of your farming needs. 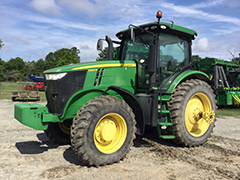 Browse various Agricultural Tractor models from top manufacturers including John Deere Agricultural Tractors, Kubota Agricultural Tractors, New Holland Agricultural Tractors and others. Be sure to check out our Agricultural Tractor Attachments that are for sale.